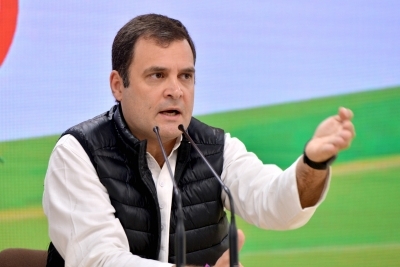 Mahuva (Saurashtra region), April 15 (IANS) Congress President Rahul Gandhi on Monday said his party's promised Nyay (Nyuntan Aay Yojana) will prove a catalyst of growth and job creation and go on to undo the "massive damage" that demonetization and GST had done to the country's economy. Addressing an election rally in Mahuva in Saurashtra region, which had brought the Congress on the verge of victory in the 2017 Gujarat Assembly elections, Gandhi said: "Narendra Modi's fake promise of Rs 15 lakh in everyone's account aroused a more feasible idea in my mind of putting Rs 72,000 every year into the hands of 5 crore families under the Nyay scheme." He said a team of economists and experts had worked out the Nyay scheme with an explanation that this would not take away any section's due and this was possible to implement if money "is not illegitimately put into the hands of a few crony capitalists". Gandhi said: "This Rs 72,000 in the hands of the poor will ramp up the purchasing power of the people. Once that happens, the small and medium-scale businesses, which were closed down after 'notebandhi' and Gabbar Singh Tax (GST) will rev up to life. Once that happens, job creation will start. Just like a vehicle engine, this will start up the system." Gandhi reiterated that Prime Minister Narendra Modi was going out of his way to enrich a handful of corporates. "He wants us to believe that he is our chowkidar, whereas he is the chowkidar of Ambani and Adani and the likes," Gandhi asserted, amid deafening cries from the crowds. He said: "When we spoke about Nyay, Narendra Modi asked where will this money come from? When we speak about loan waiver to farmers, Narendra Modi asks where will the money come from? Whenever we speak of any welfare scheme for the poor, he asks where will the money come from? "I will tell you where will it come from. It will come from the pockets of thieves. "They (government) don't have money to waive the debts of farmers, but Narendra Modiji waived Rs 300,000 crore dues of a handful of corporates," he added. Gandhi said the moment Congress governments were formed in Madhya Pradesh, Chhattisgarh and Rajasthan, the debts of farmers were waived off. "I had promised this in Gujarat and we were close to it. BJP baal-baal bach gayi."